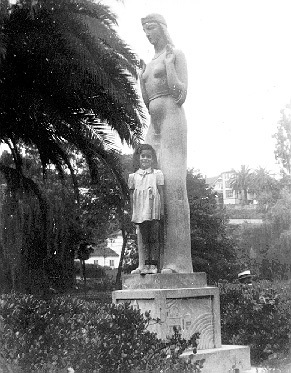 One of Echo Park’s most beloved icons is the statue of a female figure standing near the eastern edge of Echo Park Lake. Sharpless was awarded this art commission by the federal Works Progress Administration in 1934, a Depression-era program that commissioned works of public art. Originally intended to be cast in bronze, the 14-foot-high cast stone statue was given as a gift to the city of Los Angeles in 1935. Sharpless’ work can also be found at General Hospital (L.A. County-USC Medical Center) and at the Bowers Museum in Santa Ana. Ada May Sharpless was born to Mr. & Mrs. B.H. Sharpless on August 16, 1904 in Hilo, Hawaii. She grew up in Santa Ana, California. Sharpless graduated from the University of Southern California in 1922. She attended Otis Art Institute (dates unknown) and possibly the Chouinard Institute in Los Angeles. In 1925, she moved to Paris to study with Emile Antoine Bourdelle. While in Paris, Sharpless maintained a studio on Rue Boissonnade and exhibited at the Tuilleries and the Salon des Independents, where she was a member. She returned to Los Angeles in 1929, the same year as Bourdelle’s death. Upon her return to California, she became a member of the California Art Club and the Los Angeles Art Association. According to California Art Club Bulletins, she had been a member before moving to Paris. Sharpless lived at 1142 ½ Seward Street, and exhibited at many local museums and galleries. 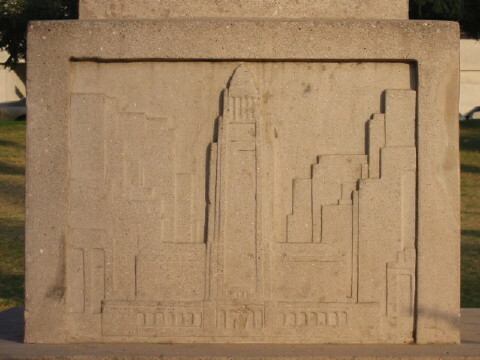 One of the four relief images at the statue’s base. Although unconfirmed, it has been stated that she married Norman Cornish and returned to Hawaii. 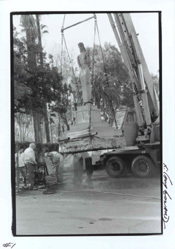 About 50 years Sharpless’ Lady of the Lake was dedicated, the statue, damaged and suffering from neglect was removed from public display in 1986 and put in storage, where it languished until it was restored and returned to public view in May 1999. It was rededicated on Oct. 10, 1999. The statue was originally located at the tip of the peninsula that juts into the north end of the lake (now the site of pumping station). The Lady of the Lake now stands on the eastside of the lake near the Boathouse. The pedestal of the Lady of the Lake features four reliefs with images of City Hall and other area features. *Some of the information in this article is based on research commissioned by the City of Los Angeles’ Cultural Affairs Department.